See our coordinating Autumn Fields Paper Pak. 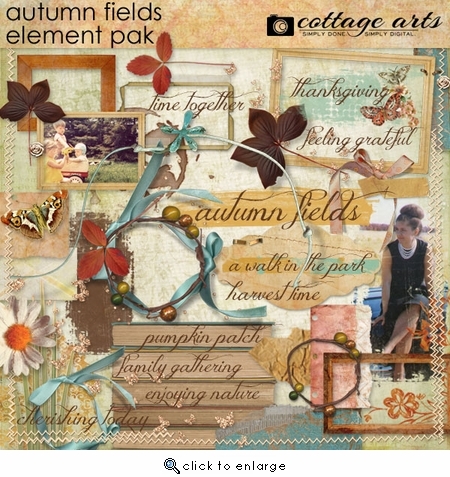 See more layout ideas using Autumn Fields in our gallery here. Kit includes 50 realistic fall inspired elements: 10 word art titles/quotes, paint stroke accents, butterfly collage stamp, frames, butterfly spray, distressed click.masks, distressed envelope, grass, vintage butterfly, ribbons, flowers, mats, stitching, tags, leaves, layered frame clusters with realistic shadows, stacked books, torn papers, torn and painted cardboard, coffee stain, ornamental stamp, flower spray stamp, tape, staple, and more. Most of the elements come without shadows (except the layered frame clusters). Includes links to two click.mask tutorials and our how-to on creating realistic shadows yourself.